It’s both dine-in and take-out. Atmosphere: Quiet, dark, and charming. A great date restaurant. Seating: They have two large tables up front – near the window – that can easily seat 6-8 people. I have also seen the waiters quickly push together several smaller tables for larger groups and then seat them right away. 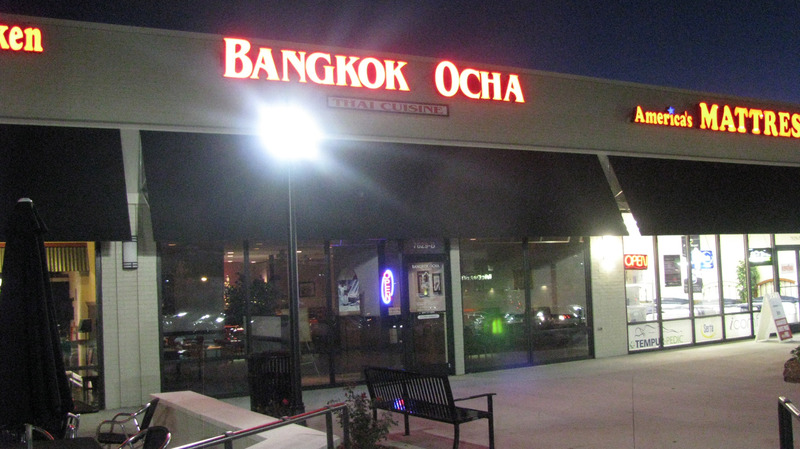 So Bangkok Ocha could be a very good option if you’re with a larger group. They also have a number of small booths. The curries, stir-fries, and noodle dishes on the menu can be made with your choice of protein. This includes beef, chicken, pork, shrimp, scallops, a seafood combination, or vegetarian with tofu! The lunch menu is a smaller version of their dinner menu. Luncheon specials include unsweetened iced tea at no extra charge. The lunch special also includes a bowl of house soup (beware, I think most soups contain chicken broth except for the Tom Kha – Coconut Soup) and a spring roll (beware, this contains chicken). I have asked if there was another appetizer that could be substituted for the spring roll and was told no substitutions at lunch. The dinner menu is more extensive. The menu has excellent detailed descriptions of most dishes (i.e., “stir fried with broccoli, mushrooms, baby corn and carrots.”) Additionally, beside the name of each dish they have in parentheses a further description – (“Garlic Pepper”) (“Basil”) (“Red Curry”) (“Yellow Curry”) (“Sweet & Sour”) – to help you further identify the dish. I’ve not had their noodle dishes myself but have been told by dining companions they were very good. Remember to request they leave out the egg in the Pud Thai, Pud See Ew, and Koi Teow. Bangkok Ocha can truly modify every dish from very, very mild to very spicy, but you have to know how to work their 1-5 spice system! They say 2 is a “medium spice” and will ominously try to dissuade you from ordering anything higher than a 3. In reality, I’d say a 2 is only faintly spicy and 3 is more the medium spice level. So try a level 3 the first time if you’re not sure, and most people will probably adjust one level up or down after that. But don’t be afraid to go for a 4 if you like your food hot and spicy (you know who you are!) and if you can handle that don’t be afraid to go for a 5 the next time! I will warn you, a Level 5 will make you sweat a little. Or, if you absolutely can’t tolerate spice, go for level 1. It is extremely mild. One Location: 7629 Pineville Matthews Road. About 2 shops to the right of the Fresh Market as you are facing the center. Closed Sunday.